The world is moving to cities, fast and for the long term. In a cognitive era, cities themselves are moving: evolving, ever-changing, not fixed on a marked destination. We are at an important point in that evolution, as new forces emerge and combine to create new ways for cities to work. Social media flourishes in this environment, revolutionizing the way leaders interact with citizens. The data that drives the smarter city must be secure, to safely fuel unhindered progress. 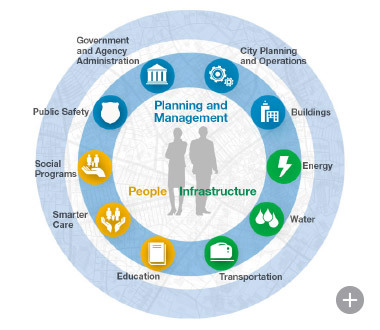 As national governments increasingly focus on national issues, cities must take greater advantage of the most advanced technologies to update service delivery. New business models target the creation of radical new efficiencies for long-standing challenges. Cognitive computing and its capacity for building citizen engagement introduces fresh opportunities for government organizations to improve citizens' lives and the business environment, deliver personalized experiences, and optimize program and service outcomes. Long-term insights based on comprehesive data analysis, followed up through efficient daily management, help a city stay vital and safe for its citizens and businesses. Fundamental services—such as roadways, mass transit and utilities—make a city desirable and livable, but the key to keeping them viable is readiness for constant change. Smarter cities use the system of systems to their advantage when supporting the needs of each citizen through social programs, healthcare and education.